The spread of democracy has been one of the most profound political changes in human history, and provides an indispensable defence against those who abuse power by oppressing others. But as many pseudo-democracies attest, elections on their own provide only a weak and often impotent defence. In many countries today that are deemed to be democratic, elections are simply a sham used by leaders to legitimise autocratic rule. The fundamental pillar upon which democracy must rest, and without which it becomes a mockery of itself, is the rule of law. The development of the rule of law has a longer history than that of democracy. In fact after its brief flowering in ancient Greece, rule by leaders elected by the people was seen as an unworkable form of government for almost 2000 years, until that is the basic principles of the rule of law had been established. So what is the rule of law and how does its presence change democracy from mob rule to an effective form of government that can protect citizens from tyranny and arbitrary violence? Tom Bingham in his book The Rule of Law sets out to answer this question by highlighting the major landmarks in the history of the system of law that now underpins liberal democracy. Bingham takes as his first landmark the Magna Carta of 1215, which he describes as the rule of law in embryo. This agreement, signed between King John of England and a group of rebel barons, was a landmark moment because it represented the first clear rejection of unaccountable, unbridled royal power. 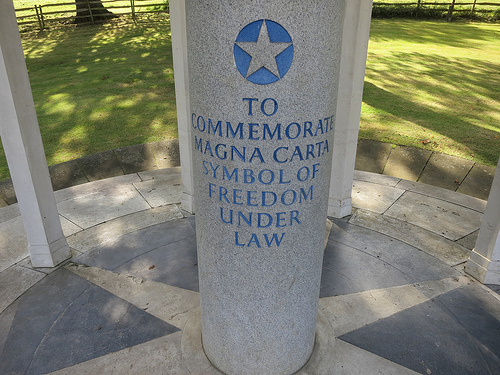 With the Magna Carta, the principle was established that even the supreme power in the state must be bound by certain rules. Bingham’s third landmark is one which western democracies have flagrantly violated in recent years – the abolition of torture. The use of torture as a means of proving the guilt of the accused was first rejected in England in the late 15th century. It was rejected on three grounds. First, that the practice was unjustly cruel when applied to someone who had not yet been found guilty of any crime. Second, that the evidence so procured was profoundly unreliable. And third, that the practice degraded all those involved. All three of these grounds for rejecting torture in criminal procedure remain valid today. Our fourth landmark moment, dating from 1670, concerns the principles to which judges should adhere in order to ensure fair trial. These principles were first written by Sir Matthew Hale, then Chief Justice in England. One of Hale’s principles is particular importance, yet it is routinely violated across much of the world today. Regarding it Hale wrote ‘That I be not biased with compassion towards the poor, or favour towards the rich.’ The violation of this principle, that there should not be one law for the rich and another for the poor, is perhaps the source of the greatest injustices in today’s world. Two further landmarks in Bingham’s concise history of the rule of law are the advances made with the writing of the United States Constitution and the establishment of the principle of fundamental human rights. The U.S. Constitution is a landmark moment because it established the principle that rulers must act in accord with the will of the people. More important still, Bingham argues, the new system of government in the new United States made the Constitution binding not only on the executive and the judiciary, but also on the legislature itself. For the first time ever, the law of the Constitution, not those in power, became the highest authority in the land. Bingham’s final landmark is the establishment of the principle of fundamental human rights. Beginning with the French Revolution and the French Declaration of the Rights of Man and the Citizen in 1789 and culminating in the United Nations Universal Declaration of Human Rights, the protection of fundamental human rights in law established the principle that every individual has certain rights that no ruler can legally violate. Bingham’s landmarks chart both a journey in history and a transformation of human consciousness. At the time of the Magna Carta the exercise of arbitrary power by individuals over powerless subjects was accepted as the norm. Today governments are obliged by law to protect the basic rights of every citizen and to create the conditions which enable every individual to flourish. Seen in this light, electoral democracy is but one means by which this fundamental objective of the rule of law may be achieved. Bingham’s insights remind us that when we talk about the rule of law in western liberal democracy, we are really talking about the equality of every citizen with regard to the law. The systematic violation of the basic human rights of the vast majority of humanity today can essentially be traced to the absence or contravention of the rule of law. In places where the rule of law is absent – as in failed and failing states – governments are unable, and often uninterested, in ensuring the basic right of personal safety for their citizens. In such places everyday violence is the norm and those whose psychological makeup attunes them to ruthlessness and callous indifference towards others thrive. In other places, where the state is strong enough to have established a monopoly on power, the institutions of law and order, including the courts and the police, are in place. As a consequence everyday violence is typically much reduced. However many of the basic principles of law as outlined by Bingham are routinely violated by those in power. In particular, the principle that rulers be subject to the same law as citizens is cast aside. In such states, the aim of those in power is often not the protection of the fundamental rights of citizens, but their own enrichment. Finally, even in countries where democracy has been established and where the rulers’ primary focus is on governing rather than self-enrichment, a failure of law enforcement can leave large sections of the population beyond the protection of the law. In all three cases, the effective absence of the rule of law provides fertile ground for those whose personality disorders equip them to ruthlessly exploit their fellow human beings. And in each case, it is the most vulnerable, including women, children and the poor, who suffer most. Read about why the rule of law matters to our democracy here. This entry was posted in Dangerous Personalities Today, Why We Need to Defend Democracy and tagged democracy, Human rights, Magna Carta, Rule of law, Tom Bingham, torture by Ian | disorderedworld. Bookmark the permalink.